Three years into her NDP government's mandate, Alberta Premier Rachel Notley has received at least 11 death threats, security documents obtained by CBC News show. 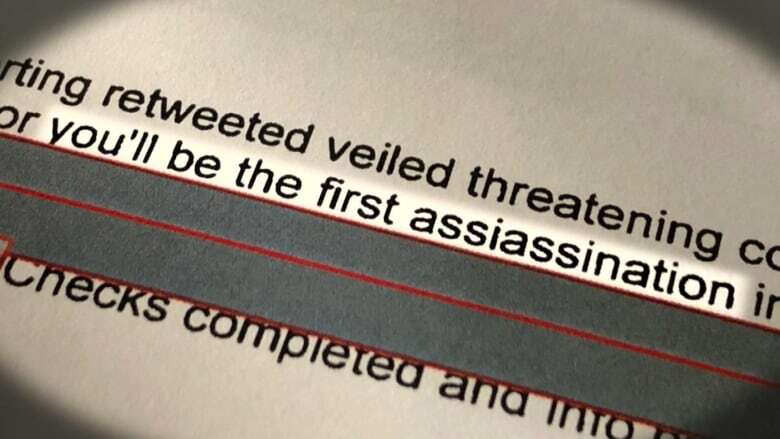 The threats began in September 2015 with a tweet and retweet of the message: "Really you dumb cow, be careful woman, or you'll be the first assassination in Alberta." More recently, while door-knocking in March 2017, one of the premier's office staff was confronted by an angry resident who said "if ___had a chance ___ would shoot Rachel Notley," a redacted document states. Notley's photo has been defiled. She's been called a Nazi. The information is contained in documents called security "occurrence summaries" obtained under the freedom of information act from Alberta Justice covering the period May 5, 2015 — the day of the last provincial election — to Nov. 23, 2017. There are 386 pages. Each page chronicles a separate "inappropriate contact and communication" or ICC incident. The incidents range from overly aggressive or insulting tweets to hate mail, vulgar photographs, unusual phone calls and outright death threats. 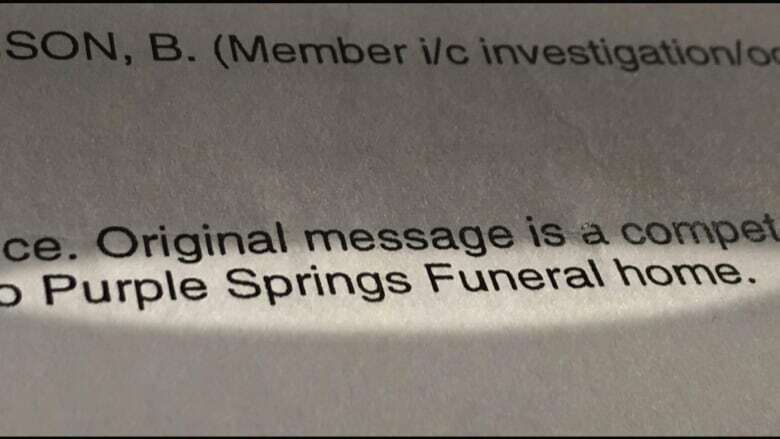 In a macabre incident on Jan. 31 2017, Notley's office was tipped off by Canada Purple Shield, an insurance company specializing in pre-planned funerals, that a funeral home had received a completed application in the premier's name — for her own funeral. It wasn't from Notley. A spokesperson for Purple Shield confirmed it was involved in an incident with the Alberta premier but refused to disclose further details, citing privacy concerns. Names of those suspected of being behind the posts or communications have been redacted from the documents. The identity of the politician being targeted is listed, however. Overwhelmingly, the cases involved Notley, with names of other cabinet ministers coming up only occasionally. On June 12, 2017, someone threatened to "shoot [Education] Minister [David] Eggen." According to another document, Justice Minister Kathleen Ganley had to report inappropriate contact 11 times, including emails, a YouTube video and social media posts. A fax addressed to Ganley received by the Court of Appeal of Alberta in Edmonton on Nov. 1, 2016, contained a picture described as "vulgar body" and "refers to a potential act of violence against _____ Premier Notley _________________." In another case, a caller used "aggressive and abusive language and derogatory comments" during a conversation with someone in the constituency office of Culture Minister Ricardo Miranda. On April 21, 2016, a person of interest was identified by employees in the Edmonton-Glenora constituency office of Health Minister Sarah Hoffman. According to a report, four investigating officers were dispatched to her office. Aggressive public outbursts against the premier first surfaced during the politically charged Bill 6 debate in the fall of 2015. The Enhanced Protection for Farm and Ranch Workers Act brought farm and ranch employees under the Workers' Compensation Act, and sparked sometimes violent protests throughout Alberta from critics who thought the bill was an overreach by the government, unnecessary or simply too intrusive. During that time, Alberta Justice began formally tracking the inappropriate incidents related to that issue. According to Jason van Rassel, spokesperson for the Justice and Solicitor General department, an inappropriate contact and communication can range from behaviour that is "overly aggressive or antagonistic" to conduct that is "grossly offensive" or "vulgar." After the uproar over Bill 6 died down, there was a noticeable spike in hostile messaging in the documents between April 18 and April 21, 2016. One threat came to the Calgary-Fort constituency office, saying the premier and Finance Minister Joe Ceci should face a firing squad: "Line you arrogant worthless jerkoffs against a wall and you know what's next, and I would be the first to pull the trigger!" A blogger suggested "dumb" Notley needed to be "taken out" and "replaced by a real leader." A screenshot from a Twitter account with a fictitious name was forwarded to the Alberta Security and Strategic Intelligence Support Team (ASSIST), the provincial government agency that monitors and assesses everything from domestic to international terrorism threats. The screenshot showed a picture of a firearm, some ammunition and a firearm carrying case. A second image was a picture of Notley. The screenshot was sent between April 18 and April 21, 2016, which didn't coincide with the anti-farm safety bill protest or an increase in the much-maligned carbon tax. The dates did, however, mark a milestone, falling around the 100th anniversary of women's suffrage in Alberta. For days before and after the anniversary, media attention was focused on issues surrounding women in politics and voting rights. Cradling her newborn son, Alberta's first Status of Women Minister Stephanie McLean presided over a large-scale ceremony celebrating the women's suffrage centennial on April 18 on the front steps of the legislature. Cristina Stasia, a gender equity consultant who teaches at the University of Alberta, was in the crowd that day. After reviewing the incident reports, Stasia said, "It just makes me very sad" but that she was not entirely surprised. "That's telling us that people in this province are still really uncomfortable with women in power," Stasia said. "That's telling us that people are still unsure if men and women are capable of the same thing." Stasia said much more needs to be known about who is behind the angry posts and threats. She said revealing the extent of the problem provides an opportunity to address it. "It's someone's husband, or someone's partner, aunt, uncles, coaches," she said. "These are people we know." Because most of the online posts came from Twitter and Facebook, Stasia thinks most of the messages are from an "older demographic," and likely mostly male. 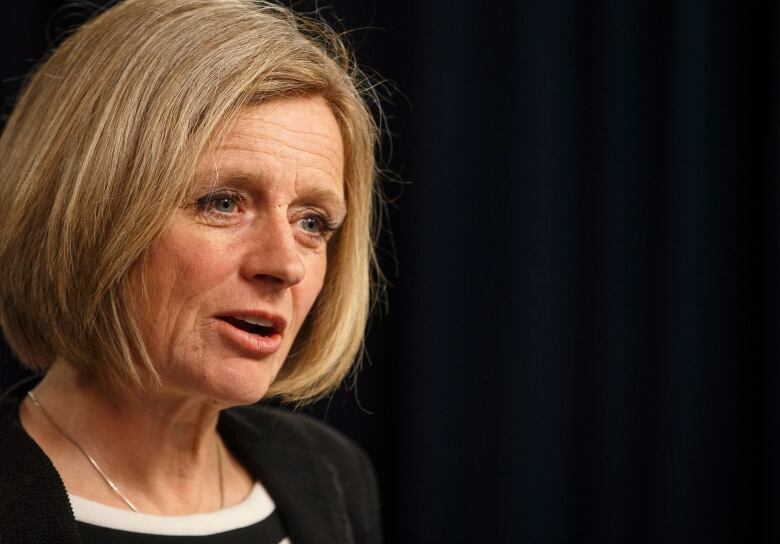 Notley declined to comment on the volume of the threats, or how they affect her job. During a news conference to proclaim May as sexual assault awareness month, Notley said it's her policy not to comment on personal security issues. But the premier acknowledged that online harassment has been an issue she and members of her cabinet have had to endure. "When you're in the public eye, the public conversations can sometimes have an accelerating effect," said Notley, who turned her response to the overarching issue of violence against women. "What I will say is people need to be able to talk with each other about those things, and seek support and be believed."